EOS Price Analysis: EOS Rolls Over at $2.50 and Continues to Fall -- Can the Bulls Defend $2.24 Again? 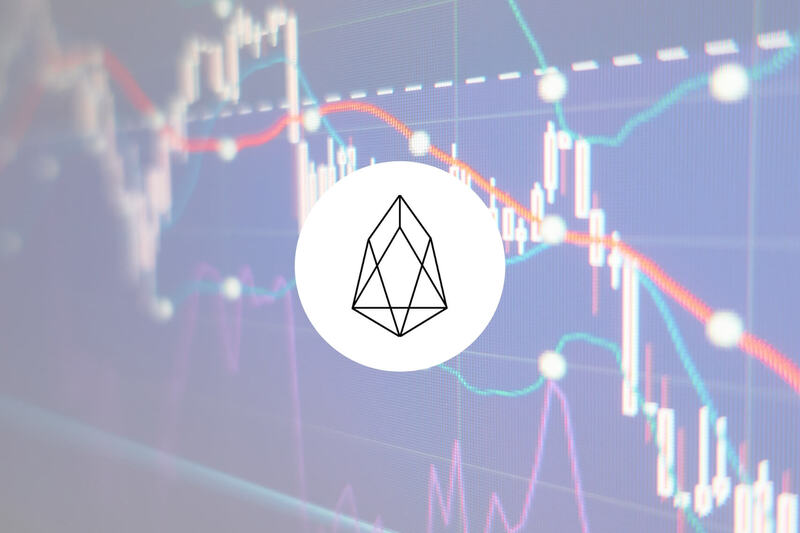 EOS Price Analysis: EOS Rolls Over at $2.50 and Continues to Fall — Can the Bulls Defend $2.24 Again? Support for EOS moving forward: $2.24, $2.15, $2.02, $2.00, $1.90, $1.74, $1.64. Resistance for EOS moving forward: $2.35, $2.56, $2.87, $2.99, $3.17. 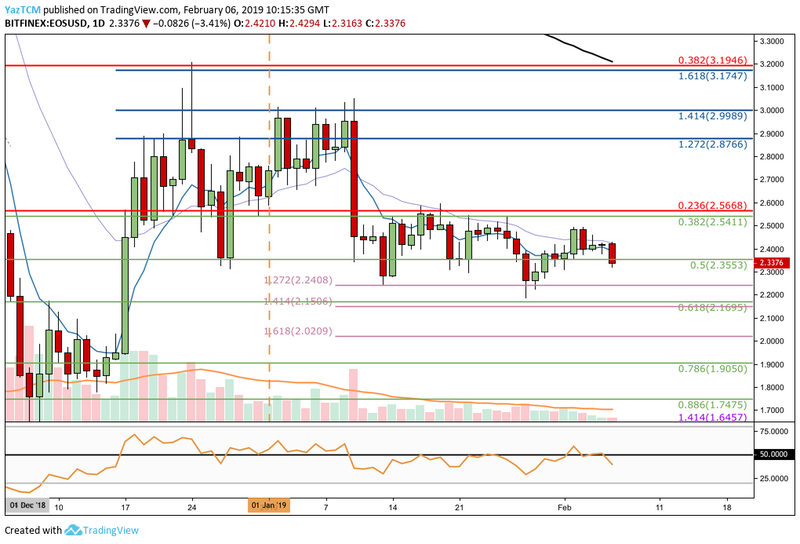 Over the past 24 hours of trading, the EOS/USD market has dropped by close to 3%, bringing the current trading price down to around $2.33, at the time of writing. The cryptocurrency now has lost a total of 18.45% over the past 30 trading days as the cryptocurrency market comes under pressure due to Bitcoin price falls. EOS is now ranked in 4th position as it currently retains a $2.11 billion market cap valuation. The 19-month old project now has lost a total of 58% over the past 90 trading days. Since our last EOS analysis, the market continued to bounce higher from our identified support at the short-term downside 1.272 FIbonacci Extension level (drawn in lilac) priced at $2.24. However, the market was unable to overcome resistance at the $2.50 handle and now has proceeded to reverse once again. We can see that just today price action has penetrated below the short-term .5 Fibonacci Retracement level (drawn in green) priced at $2.35 as it trends in a downward direction. The market is still in neutral. For the market to be considered bearish, we would need to see price action break below $2.24. For the market to be considered bullish, price action would have to break above $2.56. Where is the EOS Market Likely to Head Towards Next? If the selling pressure continues to push EOS/USD lower, we can expect immediate support below at the short-term downside 1.272 FIbonacci Extension level (drawn in lilac) priced at $2.24. Support below this is then expected at the short-term .618 Fibonacci Retracement level (drawn in green) priced at $2.16. If the bears continue to drive price action even lower, we can then expect more support to be located at the short-term downside 1.618 Fibonacci Extension level (drawn in lilac) priced at $2.02. There is then more support at the short-term .786 Fibonacci Retracement level (drawn in green) priced at $1.90. What if the Buyers Regain Market Momentum? If the bulls can regroup and begin to push EOS/USD above the short-term .5 Fibonacci Retracement level (drawn in green) priced at $2.35 to continue higher, we can then expect higher resistance to be located at the short-term .382 Fibonacci Retracement level (drawn in green) priced at $2.54. Further resistance above this level will then be expected at the medium-term 1.272 and 1.414 Fibonacci Extension levels (drawn in blue) priced at $2.87 and $2.99, respectively. The RSI has recently dropped below the 50 handle to show that the bears are in control of the market momentum at this moment in time. If the RSI continues to head lower, we could see EOS breaking below the support at $2.24. The support at $2.24 is the next level to watch for EOS. If the bulls fail to hold this level, we may see EOS falling much lower and back into the $2.00 region.